SendSMTP is a simple to use application that allows you to quickly send emails from your desktop, without having an installed client. The tool enables you to send messages by configuring the SMTP server and email addresses. This useful utility can be used to send email alerts, programmatically send files. Features include SendSMTP utilizes Transport Layer Security (TLS) version 1.2 and SSL v2/v3, support for SASL authentication (Simple Authentication and Security Layer) using certain methods. No installation is required to use this tool. Anonymous, PLAIN, S/KEY, CRAM-MD5, CRAM-SHA1 and OTP (One-Time-Password). The login credentials can be saved and encrypted with the help of the AES Rijndael method. 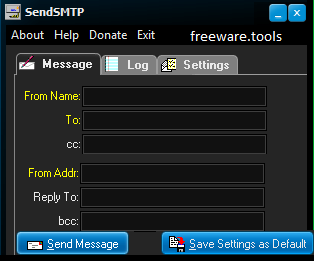 SendSMTP can be used as a standalone GUI tool since it features a friendly interface, with clear commands. The tool also features documentation that allows you to configure and send messages straight from Command Line. The program can notify you of the result of the process: success, failure or settings cannot be found. The program only allows you to send plain text messages in your emails, however, you may attach other files. In case you need to send several similar messages, you can save the text to a specific file and associate them with INI documents. SendSMTP is a reliable application that allows you send emails from your desktop even if you do not have a client program installed. You can easily perform the task using the application’s friendly interface or configure it from Command Line. Moreover, you can view a log of all the actions performed by the program.